Production of extensive amount of flyash from Coal-Based thermal power plants occupies huge areas of highly serviceable land which covers a massive area in measurement and it also creates enormous environmental hazards. Utilization of fly-ash in geotechnical constructions like highway and railway embankments, landfill, road base and sub bases etc. is gaining momentum as it proves to be an effective and effectual mean of bulk utilization of these kinds of materials. For increasing use of flyash as a construction material, it is a requisite to amplify the geotechnical properties of flyash with a suitable stabilizing agent like lime. 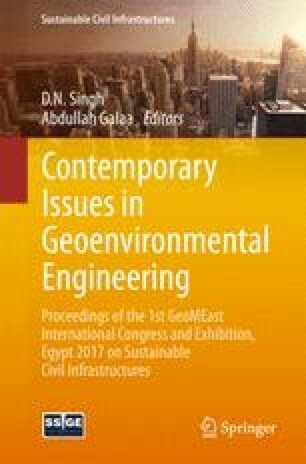 This paper describes the effect of curing temperature on strength properties and microstructural changes of compacted flyash treated with lime. Specimens are prepared with different percentages of lime compacted to densities corresponding to light and heavy compaction energies at their respective OMC. These specimens are cured at different temperatures such as 10 °C, 25 °C, 45 °C and 90 °C and the unconfined compressive strength are determined after curing periods of 0, 7, 15, 30 and 60 days. The test result showed that an increase of either lime content or curing period results in increase in the strength. The elevated temperature is found to influence both the early and later age strengths. Samples cured at low temperature show rising trends of strength even up to 60 days of curing whereas the strength of high temperature cured specimens stabilize much earlier. A crossover effect of strength is noticed between low and high temperature cured specimens. Also it is found that the incorporation of lime significantly increases the compressive strength of compacted flyash. From the microstructural study it was found that the addition of lime along with curing temperature might generate more amorphous hydration products and accelerate the reaction rate of raw materials.